Hadar Aviram, “Troubled Waters: Diana Nyad and the Birth of the Global Rules of Marathon Swimming,” Mississippi Sports Law Review, volume 4, issue 1, pp. 30-94. Available at: https://repository.uchastings.edu/faculty_scholarship/995. Retrieved 28 Mar 2019. “The Woman Who Swam Around Manhattan Plans to Tackle the English Channel, Round Trip,” Mary Vespa, People Magazine. “All She Hears Is Water, All She Sees Is Fog,” Nickie McWhirter, Detroit Free Press. Does it matter that Diana’s mother never sees her swim and that she has not seen her father for 10 years? I don’t know. It’s a morality play. All fanatics—especially those who are fanatics about themselves—are boring. That’s what Diana seems to miss. Diana is such a joke to anybody who knows anything about marathons. The timing of the book is peculiar. 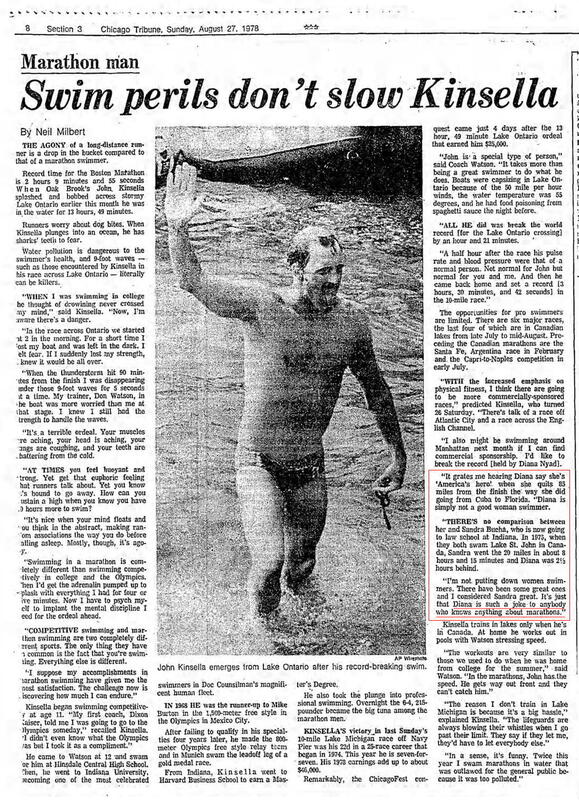 Nyad wrote it before the Cuba swim, but it was to be published after, as if she had completely ignored the possibility that her swim might fail. [Diana Nyad is] a very mediocre swimmer with a very good publicist. Most of her swims have been failures. For instance, she has attempted to swim the [English] Channel three times and has never finished. Despite failure after failure in attempts to swim from Cuba to the United States, and even to make the common English Channel Crossing, Nyad, whom I initially interviewed in 1971, has become such a master of hyperbole that she always seems able to lure a lapdog crowd of media to her events.